Not sure how this depicts The Star? Click here. Etteilla: Desolation, Destitution, Despoilment, Air, Dryness, Heaven, Vague and Without Substance, Music. IIlustration (left): The Star from Grand Etteilla: Ou Tarots Egyptiens (published by Grimaud, based on Eteillas original deck of c. 1788). Click the image for a larger one. 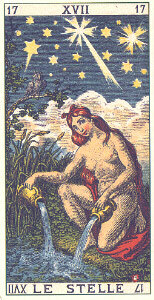 Lévi: We find, in the Star, an admirable allegorya naked woman, typifying Truth, Nature, and Wisdom; above her head glitters the septenary, starred about an eight-pointed star, that of Venus, symbol of peace and love; the plants of earth are flourishing around the woman, and on one of them the butterfly of Psyche has alighted. Christian: The girl depicted here is the emblem of Hope which scatters its dew upon our saddest days. She is naked, in order to signify that Hope remains with us when we have been bereft of everything. Papus: The fall of the Divine and of the Human into the Material has scarcely taken place, when a mysterious voice whispers courage to the Sinner, by showing him future re-instatement through trial. No destruction is final. Everything is eternal and immortal in God. Illustration (left): The Star from Antichi Tarocchi Italiani (Ancient Italian Tarots) (c. 1880) (copyright &COPY; 1996 Lo Scarabeo). Click the image for a larger one. 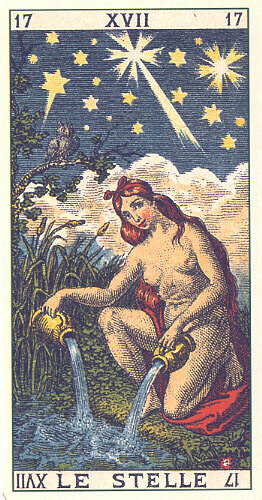 Felkin: This shows the seven-pointed Star of Venus shining above the Waters of Aquarius, the guiding force of love in all its forms and aspects, illuminates the soul during her immersion in Humanity, so that the bonds of Saturn are dissolved in the purified Waters of Baptism. Waite: For the majority of prepared minds, the figure will appear as the type of Truth unveiled, glorious in undying beauty, pouring on the waters of the soul some part and measure of her priceless possession. But she is in reality the Great Mother in the Kabalistic Sephira Binah. Wirth: The earthly life, which we love more than anything in spite of the material slavery to which it binds us, leaves us plunged in a darkness which would be complete if it were not for the stars of the firmament. Case: The great yellow star signifies the cosmic radiant energy which is sent forth from the various suns and fixed stars of the Universe. The inventors of Tarot used innumerable devices to remind us that in our mental and magical work we are using an actual force which has definite physical forms of express. Crowley: I give unimaginable joys on earth: certainty, not faith, while in life, upon death; peace unutterable, rest, ecstasy; nor do I demand aught in sacrifice. I am the blue-lidded daughter of Sunset; I am the naked brilliance of the voluptuous night-sky. To me! To me! Gray: Hope, courage, inspiration. No destruction is final. Unselfish aid will be given. Good health. Spiritual love. Sadhu: What actually is the speech of this Archetype? It is the language of eternal Hope, understandable for those who listen to it. Even then, when apparently everything around us is silent, and when everything forecasts only peril for us, Hope acts, and radiates its rays throughout the darkest corners of our consciousness. ONeill: This figure on this card is obviously a good spirit, an angel, the Anima in her most cooperative and loving aspect. She might represent the Shekinah of the Kabbalists, or perhaps Hebe, the cupbearer of the Gods. She is Virgo and Aquarius. She is the Virgin Mary, the star of the seas, Maris Stella. 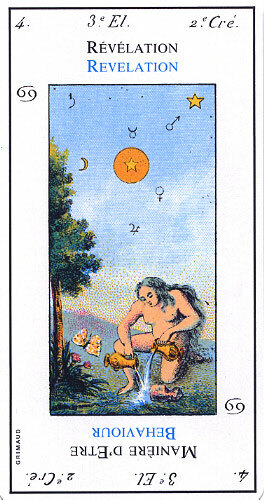 This card might have also suggested Isis, as the goddess of the Nile. Pollack: After the storm peace. Lay the cards out for someone who has never seen them and the Star will hardly need interpretation. Everything in it speaks of wholeness, openness, and healing. Turk: When the star Sirius rose on the horizon and announced to the Egyptians the flooding of the Nile, by tears of bereaved Isis, a festival was celebrated. This festival became first, the Feast of the Visit of the Magi, and secondly, the birth of the new Aeon, exemplified by the birth of Christnow known to us as Christmasand by this means the Star becomes also the star of Bethlehem. Symbol (top): It depicts a comet and three stars.